This book has everybody talking… literally! Whether you’re an experienced presenter or just starting out, if public speaking is your ultimate high or your recurring nightmare, you’ll appreciate the incredible wealth of information, insight and intimate details! 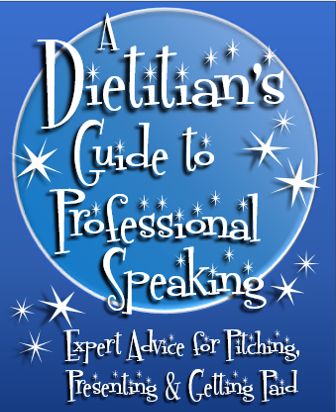 A combination of mentor, cheerleader, and the friend who catches you before you take a live mic into the bathroom, author Jessica Setnick shares every high, low and hysterical snafu on her path to dietitian celebrity, including all the things she learned the hard way so you don’t have to. Included in the mix of candor and practical tools is the real scoop on tackling the steps to success. Nowhere else will you find the perfect blend of personal and professional advice on every aspect of speaking, including believing in your value, logistics, travel, choosing what to wear, negotiating fees, managing stage fright, handling hecklers, planning your exit, weathering rejection, following up, keeping evaluations in their proper perspective... and much, much more. All pre-orders will be personalized and signed by Jessica! For bulk orders or if you are considering use as a textbook, contact Celena Caballero at info@UnderstandingNutrition.com. 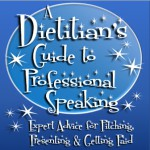 User Reviews For A Dietitian's Guide to Professional Speaking: Expert Advice for Pitching, Presenting & Getting Paid!